Will smartwatches and cars give the Tizen OS the traction it hasn’t gotten in smartphones? The OS’s backers are getting their hopes up in advance of a developer conference next week. More than a thousand developers and contributors are converging on San Francisco for the Tizen Developer Conference. The mood ahead of the event is more upbeat than a year ago: Samsung Electronics’ launch of the Gear 2 and Gear 2 Neo at Mobile World Congress was a lifeline for the OS. With those smartwatches launched—while smartphones running Tizen are still missing in action—there’s been a change of priorities for the Tizen crowd. “There will be a major focus on wearables at the conference, and specifically the Gear 2. Companies are coming to show off what they have and there is an entire track devoted to wearables, to the developers who are there to get their heads around what’s different when you are writing an app,” said Brian Warner, manager of the Tizen project at the Linux Foundation. Warner also runs the Tizen community developer hardware program, which lets developers get their hands on devices, and he has seen a lot of requests for Gear 2s. 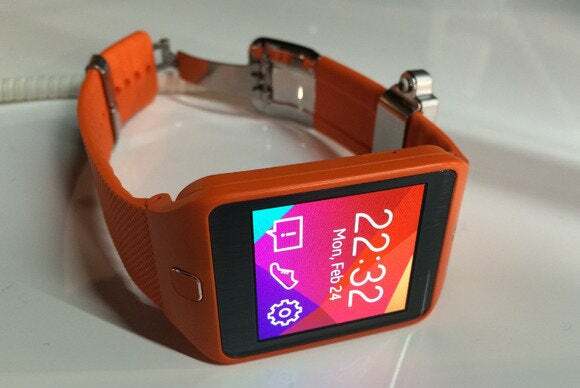 In a show of further support, Samsung is said to be updating last year’s Android-based Galaxy Gear to Tizen, according to an unconfirmed report from Sammobile.com. Meanwhile, Tizen-based in-vehicle infotainment systems will also be featured at the developer conference, with two cars on display, including a previously shown concept car from Jaguar Land Rover. Tizen has become the reference distribution for AGL (Automotive Grade Linux), which is backed by Hyundai, Nissan, Toyota and Jaguar Land Rover. It has also been certified by GENIVI, a non-profit industry alliance that counts BMW, Honda, Peugeot Citroën and Renault as members. All told, that demonstrates a lot of interest among major car makers. “The unique value of Tizen is really actually more about the value of using open source and Linux, in general,” Warner said. From day one, Tizen was designed using open source components that are energy efficient and fast, which means it can fit on a broad range of devices with highly variable computing resources, according to Warner. Unlike with smartphones, where the chief contenders for OS primacy seem established, the battle over what OSes wearables and in-vehicle infotainment systems will run is still being decided, making it easier for Tizen to make a mark. But it won’t be easy, because both sectors are highly competitive, according to Ben Wood, director of research at CCS Insight. In the car sector, the Tizen camp will have to duke it out with BlackBerry’s QNX OS as well as Google and Apple, he said. The smartwatch sector is also about to get more competitive with the arrival of the first devices based on Android Wear. Tizen’s future success is very much dependent on Samsung putting out smartwatches, cameras, TVs and smartphones using the OS. “That means you’ll start to see a critical mass of devices that will make Tizen more interesting to developers. If that doesn’t exist developers really aren’t that fussed, they just don’t care” Wood said. Tizen is going to enter the market quietly, rather than with a big bang, according to Warner. “My hope is that we’ll continue to see this drum beat of devices come out that are running Tizen. I would also very much like to see a handset come out, and be well received,” he said. At Mobile World Congress, Samsung said it still intended to launch smartphones based on Tizen, but since then the company seems to have focused on getting the Galaxy S5 out the door. The latest rumor is that Samsung soon plans to introduce the first phones in Russia and India. The Tizen Developer Conference will be June 2-4 at the Hilton Union Square in San Francisco.